I have a huge bag of flax seeds I got from Kitchen Kneeds in Ogden last year. I decided to learn a little more about them to see if I’m using them correctly. Boy Howdy. I’ve pretty much been wasting the little wonders! You can eat whole flax seeds but you need to chew them good to break them up. 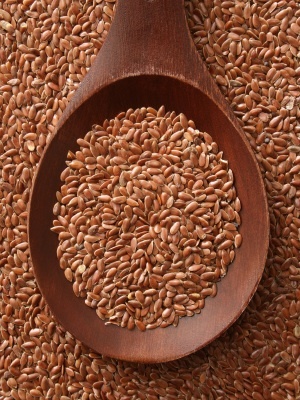 Your stomach will not dissolve whole flax seeds and many of them will come out in your stools. Chew about a tablespoon in the morning. Then drink 8 oz of water. Make sure if you chew flax seeds that you drink water since the seeds expand and become gelatinous. There are brown and golden colored flax seeds. The golden cost more but there is not difference in their nutritional value. You can grind them up in a grinder and add them to your smoothies. It is best not to use them in any cooking recipes. Heat destroys the value of the flax oil and makes it toxic. I don’t recommend you buy ground up flax seeds as found on websites or in health food stores. Once you grind your flax seeds, you need to use them in your drinks or food soon after grinding so they don’t lose their nutritive value. Even though Nutri Flax, ground up flax seed, is packaged so the flax seeds don’t see light or oxygen, what happens when you open the package? These flax seeds are going to be exposed to oxygen and light and as time passes they will become oxidized. It only takes 10 to 15 minutes in light and oxygen for the ground up flax seeds to become oxidized and lose it nutritive value. So if you decided to use pre-grounded flax seed like it Nutri Flax, store it in your refrigerator immediately after it is opened and used to minimize its oxidation. Obviously my bag is nutritionally worthless, but since I can’t seem to throw them away, I’m going to add them to the potting soil in my big plant. Nah, I think I’ll just toss these and get some more.